Primal Cuts Market is an excellent example of a place that doesn’t necessarily exist too many places anymore: a genuine local butcher. This is a place where people will learn your name and happily give you tips and advice on how best to prepare the carefully chosen selection of high-quality meat products they carry. 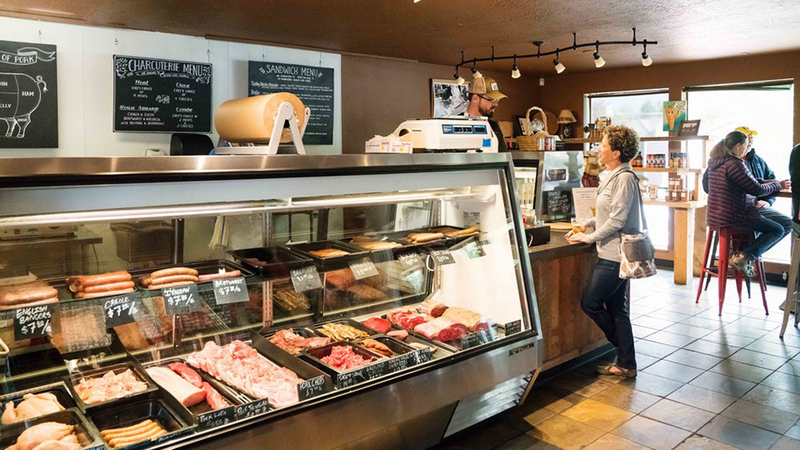 Their meats come from livestock that have been sustainably raised in the Pacific Northwest region and their case is full of housemade sausages and dry aged ribeye and other goods for grilling. They have a rotating selection of several sausages in a variety of flavor profiles. They also have house smoked bacon and fantastic dele meats like turkey, ham and pastrami. They make all of these amazing proteins into tall, hearty sandwiches and charcuterie boards you can order at the counter and enjoy at their tables. Thirsty? Never fear, Primal Cuts is also the home of Growler Phil’s, so you can enjoy a pint from their 36 taps of craft beer, cider, kombucha and nitro coffee, or take a growler to go along home with your butcher paper-wrapped package of nummies.